This session of guided meditation will be led by Ajahn Sarayut, the Abbot of Wat Buddhametta or Maechee Khanti (a Buddhist nun) or Dionne Thomas or Pamela Patrick, our lay-teacher team. At every session there is a welcome and an introduction. After that we have a guided sitting meditation, instruction on walking meditation followed by walking meditation, and we close with another sitting session. (Please let us know if you have any mobility/balance issues in advance so we can make accommodation for you.) You will be expected to sit for approximately 20 minutes for the sitting meditation sessions. 10 minutes of guided sitting meditation instruction followed by 10 minutes of silent meditation. 10-15 minutes of walking meditation instruction followed by 15 minutes of walking meditation. 10-15 minutes of a silent sitting meditation. 10-15 minutes of loving-kindness meditation/reflection by the meditation leader. Please note: You may sit in the traditional sitting meditation position, on the floor with cushions and we also have chairs for sitting. We always begin and end our class with a bow of gratitude and respect to the Buddha, the man, and the teacher who discovered this path of the practice. The bow-in is the traditional way of showing our respect and welcoming mindfulness. Bowing does not mean you are a Buddhist. Feel free to follow but it's fine if you do not wish to. Below are some guidelines for you when you enter this sacred space. 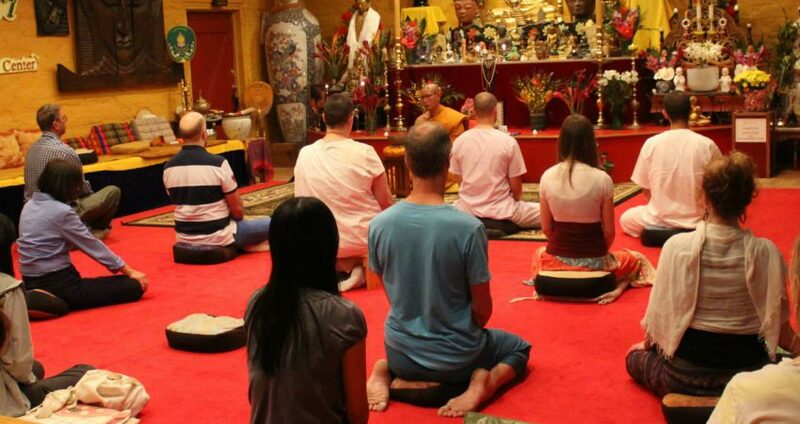 You are entering the home of a community of Buddhist monks as well as a meditation center. In order to support an atmosphere of mindfulness, peace, and spiritual contemplation, we have prepared a Mindfulness Checklist below to make your visit more comfortable and informed. This checklist is intended to support a spiritual practice. 1. Please, NO short shorts, short dresses, or tank tops. This applies to both men and women. If needed, we provide sarongs and long pants that can be worn during your visit or meditation session. Remove your shoes in the entry room. Disposable shoe coverings are available if there is a medical reason for not removing your shoes. 2. Monks and nuns do not shake hands or hug. To greet residents of this Wat, simply press your hands together at the heart and bow. 3. When sitting in the Buddha Room for meditation or a ceremony, do not stretch your legs/feet out in the direction of the altar. Instead, stretch them out in the direction of the windows. Please also remove your hat when you enter the Buddha Room. 4. Silence your cell phone and lower your voice during meditation, ceremonies, and classes. Come and join us to discover peacefulness in your own mind with the practice of being mindful. You are welcome to bring your friends. May you be well, happy, mindful, and may you find peace in your meditation practice.